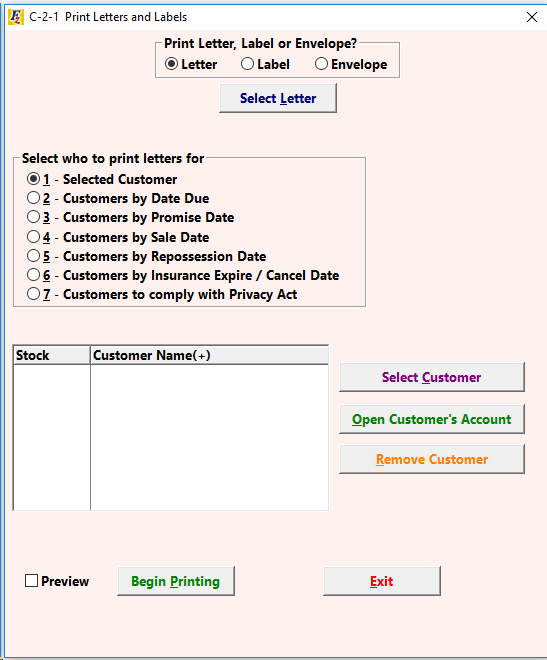 To print a letter for one customer, or multiple, go to Customers >> 2 -Letters and Labels >> . Click on to choose the letter to be printed from the existing list. Click on to choose a customer (or multiple customers) from the Prospect or Customer Activity file for whom to print. Click the button again to add another specific customer, if necessary. Other options for a range of customers are also available. Click on . The letter will print directly to the printer (no print preview is available). A button is also available in a specific selected customer's account if accessed via . The letters are not editable from this screen.